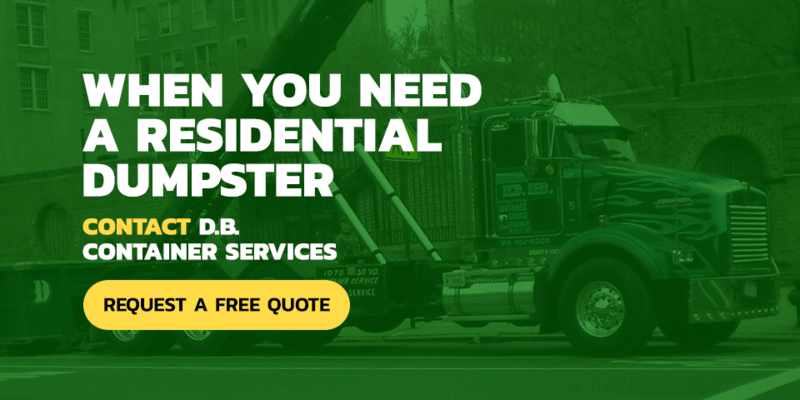 It won’t be long until warmer weather brings back new buds, green grass and birds singing in the trees, so it's time to consider when to start your spring cleaning. It’s wise to start thinking about your spring-cleaning checklist now because a spring clean is different than the usual tidying up you do regularly. A spring clean results in a deep-cleaned house which makes that routine cleaning easier and more efficient. A spring clean means going room by room cleaning and de-cluttering so that our homes are fresher and more organized. The first early days of warm weather are the best time to start spring cleaning. It's essential you air out rooms that have been closed up throughout the winter. As part of your cleaning efforts, you want to bring in fresh air into your home to refresh things like your mattresses, your laundry room and your bathroom. In the New York City area, spring normally starts towards the end of March and early April, when the Yankees and Mets begin playing baseball. In fact, the start of baseball season is a great time to start spring cleaning. Days may still be a bit cool, but they are warmer. 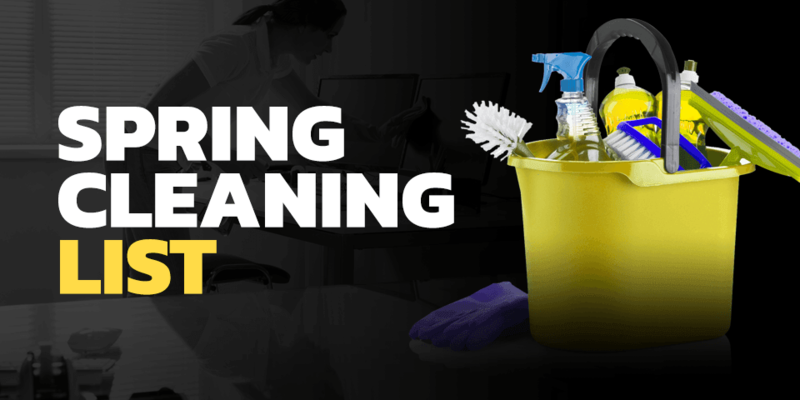 We all have a little more energy when spring comes, so it’s a great time to grab your spring-cleaning tools and get to work. To do a thorough spring cleaning, don’t try to do it all in one weekend. You will only get tired and frustrated. 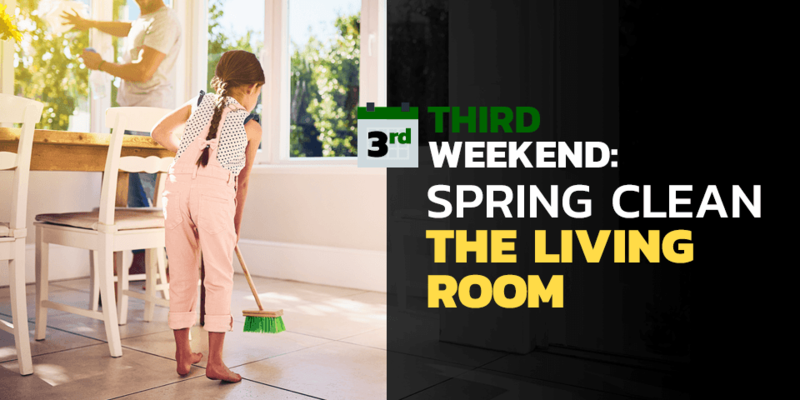 Our spring-cleaning checklist stretches over four weekends with each weekend dedicated to a particular section of your home. 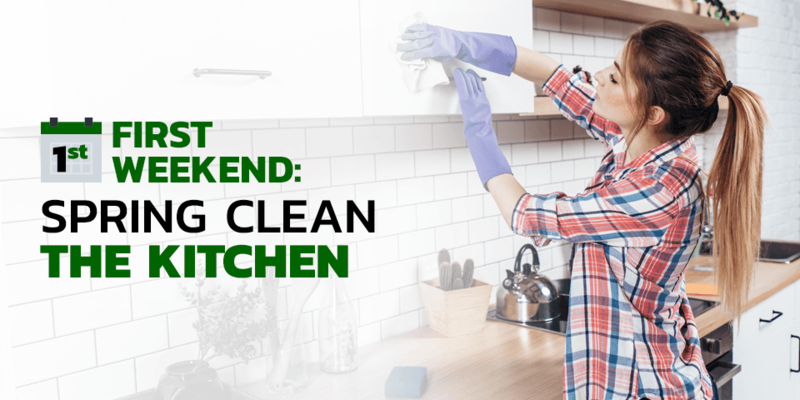 Focusing all your energy and time on doing that cleaning one day on the weekend will give you both the satisfaction of a job well done and the impetus to move on to the next area the following weekend. Clean from top to bottom so that you won’t be knocking dust and dirt on a surface that you’ve already cleaned. So what you want to do is work on one section of each room, starting at the top left and working to the bottom right. This will help you keep track of the areas that you’ve already cleaned. Do the dishes if they are dirty. Tidy up the room as much as possible by putting items that should not be in the kitchen into one of the four boxes. If you have not used any kitchen item for more than a year, donate it. Take everything out of the fridge and freezer and place these contents in a cooler. Unplug your refrigerator or turn it off. It’s best to clean when the shelves inside are at room temperature. If you try to do it before that, hot water may crack the cold shelves. Meanwhile, prepare a mixture of one quart of hot water and two or three tablespoons of baking soda. When the shelves have reached room temperature, remove them and use this mixture to clean the shelves in the kitchen sink. Wash, rinse and dry them, then set them aside. Now use that same mixture or your all-purpose cleaner and wipe out the inside of the refrigerator and freezer. Don’t forget the door seals. Use a little dishwashing liquid and some warm water on the seals to make sure you get out any debris. Make sure you dry them very well. Once you have dried the refrigerator and the freezer, return the shelves and the contents then turn the fridge back on. Remember to start at the top and work your way down. The tops of your cabinets and even your fridge could have a lot of dust or grease that has accumulated over the year. Use dishwashing liquid in warm water. Take all the items out of the shelves and the drawers and clean the insides using warm water and dishwashing liquid. Dry them and return contents. Mix two teaspoons of liquid soap, two cups of water and about a quarter-cup of white vinegar in a spray bottle. Spray onto the glass and then use old newspaper to clean it. The ink on the paper is a mild abrasive and gives you a streak-free clean. To clean your window screens, put a little warm water and soap on a carpet remnant and gently wash the screens. This will remove much of the dirt and grime attached to your screens. If you have stove grates, remove them and use soapy steel wool pads to get them clean. Then clean the oven. For a ceramic top, use wet dryer sheets to remove burnt on grime and food residue. Let the wet dryer sheet sit on the top of the stove for about 15 to 20 minutes before you wash the top with warm water and dishwashing soap. To return the original shine to kitchen appliances, mix together a tablespoon of cream of Tartar and enough water to make a slightly milky paste. Then rub this into your stainless steel appliances. Use a white cloth to wipe the paste away, and you’ll see the shine back again. Take your trash can outside and scrub it with clean soapy water. Rinse and let it dry in the sun. Before you return it to your kitchen, douse it with antibacterial spray. Take all the items that don’t belong in the bedroom and put them in one of the four boxes. 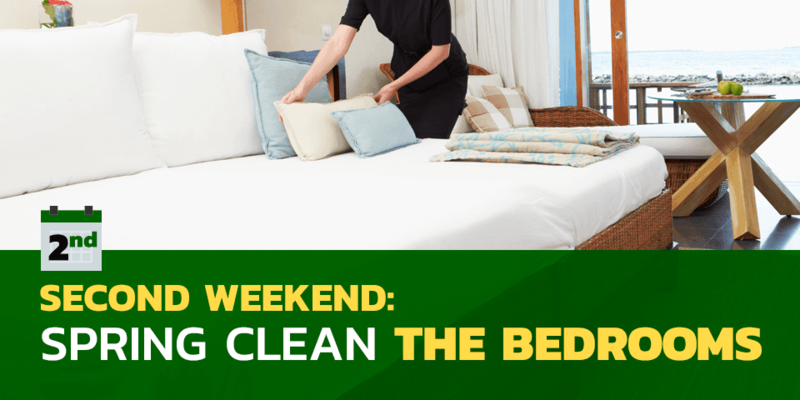 Clean up any trash in the room including anything under the bed or nightstand and put it in the trash box. If your bedroom has curtains or drapes, remove them to have them washed or dry cleaned. Take all the sheets off your bed including your pillowcases and wash them. Remember top to bottom, left to right. Start with the ceiling fan if you have one. Use a long-handled duster to clean it. If you’re still having a problem, try taking an old sock and wrapping it around the duster to see if you can remove any more grime or dirt from the fan that way. Remove anything from the walls and put them on the bed. Starting at the entrance, dust the ceiling, the windows, the moldings around the windows and the doors, the walls and the baseboards. One way to get rid of dust or cobwebs on the ceiling is to wrap a pillowcase around a broom and use it to clean hard-to-reach places. Dust the artwork or photos and rehang them on the walls. 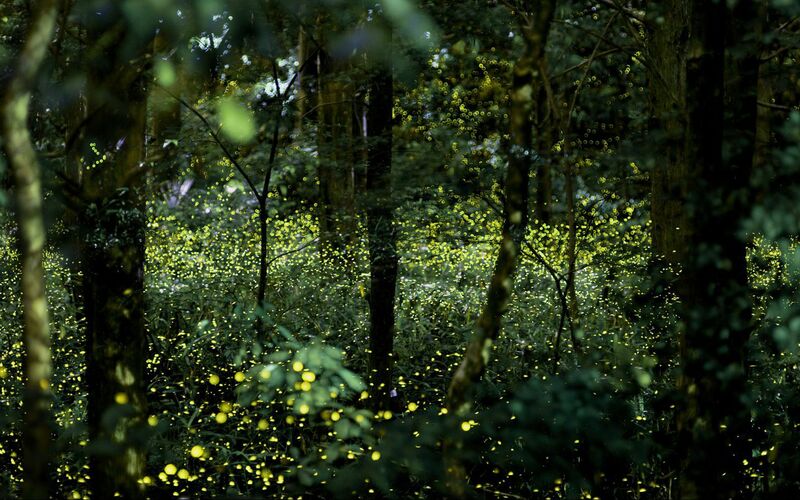 Open the windows and remove the screens if possible. As explained in the kitchen section, clean the screens using a carpet remnant and the windows using newspaper. Before you polish, it's a great time to try to cover over any scratches on the furniture. First, vacuum the top of your mattress with your upholstery attachment. Flip mattress and vacuum the new top and the sides. Be thorough. If you can, move the furniture so you can clean underneath. Use the vacuum’s floor attachment to get under the bed. Try the crevice attachment at the base of the walls. Now vacuum the entire floor. If it’s still a bit cool outside, keep it to about half an hour. If it’s warmer, you can leave the windows open for up to three hours. As you have done in the previous two rooms, take everything that does not belong in the living room and place it in one of the four boxes. This is a great time to gather books to donate to your local library. Put old magazines in the recycle box. Get any trash from underneath the furniture and put it in the trash box. Again, take down the curtains or the drapes to have them washed or dry cleaned. As you did in the bedroom, dust the ceiling fan with the long-handled duster. Take down all the artwork and pictures, and put them on the couch. Dust the room starting with the ceiling, the corners, the window frames and windowsills and finally the baseboards. With the clean microfiber cloth, clean the artwork and the pictures and then return them to the walls. Take all the pillows and cushions outside, give them a good beating and let them air out. Use the upholstery attachment on the vacuum and clean the sofa and the chairs. Don't forget the sides and the back. Use the crevice attachment and get in between the side of the cushions and into the backs of the furniture. Use your all-purpose cleaner to remove gunk from your furniture. Dry and polish it. Use the clean methods recommended above to clean the screens and windows. Spray the compressed air into the crevices of all of your electronics. Then use a microfiber cloth to clean DVD players, stereos, computers, televisions and other electronics. Make sure you wipe away from the ventilation area. The last thing you want to do is push dust into your machines. Using the dusting attachment, clean your lampshades. For the base of the walls and any heavy furniture, use the crevice attachment. Vacuum the floors. If you have hardwood floors, hopefully you have pads under your furniture that makes it easy to move. As you vacuum, move each piece of furniture to the side or pull it out so that you can vacuum the entire room. 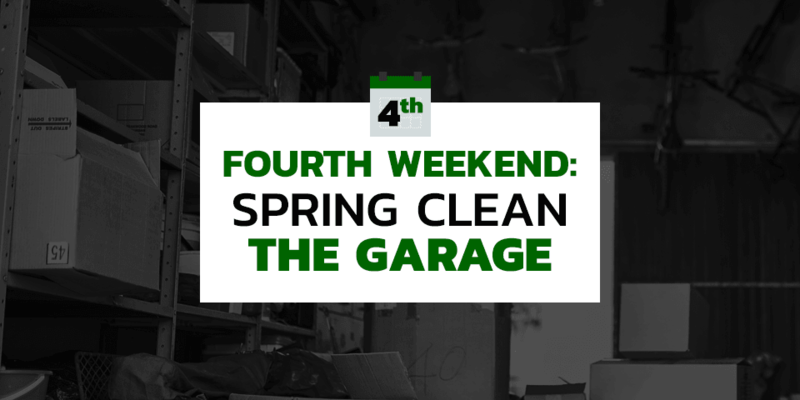 Some people may argue that it’s best to start with the hardest task and would advise you to begin your spring cleaning with your garage, but there’s something to be said for leaving it until last and knowing that when it is done, all your spring cleaning chores are finished. Let’s face it, most of our garages are disaster areas. It’s probably best to move everything out onto the driveway, which means making sure you have good weather. This will make it easier to decide what needs to go into each of the four boxes. If you have any hazardous waste to dispose of, put those to the side. Once again, top to bottom and left to right. Use your broom to clean the ceilings the corners and the walls, keeping a close eye for cobwebs and other bits of loose hanging dirt. It’s a good idea to close the garage door and clean it. If the floor is covered with oil spots, use a little liquid detergent in hot water to scrub it. Sometimes you will need to get down on your hands and knees and use a stiff bristle brush to get rid those spots. If you can, hose out your garage starting at the back and working towards the front. You want the floor clean before you bring things back in. Most of us use our garages for a variety of purposes. The key to a clean garage is organization. Think about the ways you want to organize the materials that need to go back into the garage. Do you want to have a work area? Is there space for storing your holiday decorations? Do you have a lot of sports equipment that you use regularly? Keep these items together, and it will become much easier to find them when you need them. If you can, use vertical storage shelves. This is much better than storing things on the floor. It helps to use all the space in your garage, and it means that if there is a flood, your belongings won’t be ruined. It will also help you keep your floors cleaner throughout the year. As you store materials, especially boxes, make sure you label what's inside. You don’t want to search through a year's worth of decorations to find the ones you want. Take those water stains off your faucet with a lemon. Rub a half a lemon on the water stains. The citric acid works well on hard water marks. To get rid of lime buildup around the faucet, cover it with a paper towel and soaked with vinegar. Let that vinegar set for about an hour. This will loosen the deposit and make it easier to remove. Use the other half of that lemon to clean the microwave. Squeeze the juice of half a lemon into half a cup of water. Toss in the lemon rinds as well. Put on a high in the microwave for three minutes, then let it stand for a few minutes. Don’t open the door. This will help loosen all the grime in the microwave so you can easily wipe down the inside. Clean your stainless steel sink with baking powder. Simply wet your sink, sprinkle the baking powder and scrub. If you need a little more scrubbing power, add some salt of the baking soda. Use coffee filters on your electronics. Coffee filters are gentle enough to wipe away fingerprints, smudges and dust as long as you don't press too hard. Use a window squeegee for pet hair on your rug. This spring-cleaning hack works incredibly well. You might be surprised how much pet hair a squeegee will bring up from your rug or your carpet and then you can just vacuum it away. In hard-to-reach places, put a towel on a broom. If a long-handled duster won’t reach far away corners of the ceiling, wrap a towel around a broom and secure with an elastic band. Then you can reach the dust and cobwebs that need to be cleaned away. Don’t throw away those old socks. They make great dusting mitts. You can use them to polish the furniture in your bedroom or in your living room. As you spring clean, you will likely discover that you need to throw away a lot of trash and old junk. But you don’t want to pile everything in front of your home or in your driveway. D.B. Containers has the perfect solution. We offer a 10-yard container ideal for residential purposes. We drop it off, you fill it up, and we take it away. We also offer larger size containers for heavier jobs. 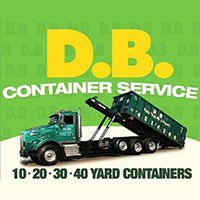 To learn more about our line of containers, call us at 718-257-2300. You can also request a free quote online and a member of our team will get back to you soon as possible to help you with your selection.